Las Vegas had about 40 million visitors last year and those visitors all had to eat while they were here. With numbers like that, it means there are some staggering statistics when it comes to the amount of food Las Vegas restaurants produce and serve. We’ve got buffets that offer 500 types of food and we’ve got restaurants that serve more than 70,000 pizzas in a year. We also like to do over-the-top things here in Vegas so you’ll find record-breaking food including the most expensive sundae in the world and a $5,000 burger. 360 pounds of caviar were spooned at Buffet Bellagio in 2014. 98,719 pounds of crab legs were cracked at the Aria Buffet in 2014. At Double Barrel Roadhouse at Monte Carlo Resort and Casino, the chefs smoke nearly 18,000 pounds of meat every month. They also go through 50 bottles of bourbon to make their signature secret BBQ sauce. Via Brasil Steakhouse serves 1,200 pounds of Brazilian Top Sirloin (Picanha) and 420 pounds of filet mignon per month. The restaurant serves a total of 10,000 pounds of meat per month. According to Reader’s Digest, people in Vegas eat more than 60,000 pounds of shrimp per day. 46,363 margaritas were sipped at Hecho en Vegas in MGM Grand in 2014. Via Brasil uses 12 liters of cachaca each month to make their Caipirinhas. They also serve 300 bottles of wine per month. 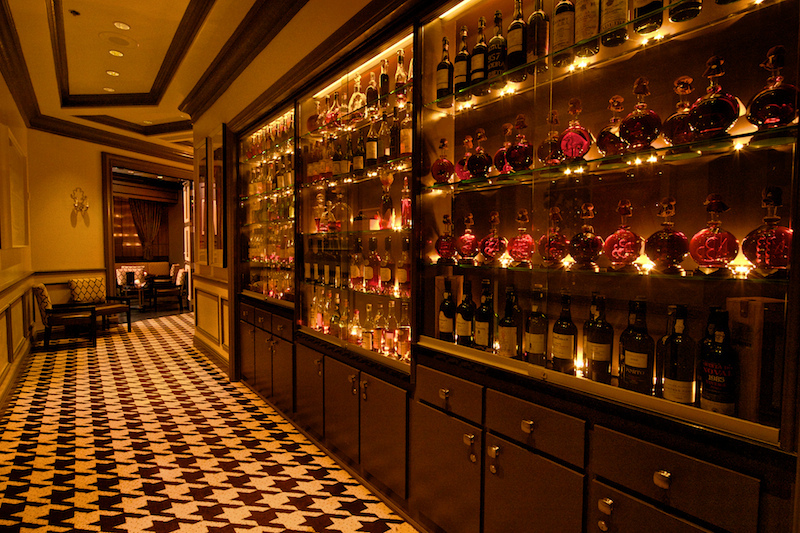 Chef André Rochat’s Armagnac and Cognac collection at his restaurant at the Monte Carlo is the largest in Las Vegas and is ranked third in North America based on its size (more than 200 bottles of single-malt Cognacs, Armagnacs and Scotches). One of the bottles, from 1777, is worth $40,000. There are just four bottles in the world. BLVD Creamery at Monte Carlo has offered 8,464 ice cream flavor combinations since its opening in May of last year. 72,663 whole pizzas were served at Aria’s FIVE50 Pizza Bar (729,753 slices enjoyed) in 2014. The Quadruple Bypass Burger at Heart Attack Grill will cost you 9,982 calories with four half-pound beef patties, 20 strips of bacon and eight slices of American cheese. Don’t worry – diners who weigh more than 350 pounds eat for free. The Bacchanal Buffet at Caesars Palace has more than 500 items of food including more than 300 items for dinner and more than 95 items for breakfast. 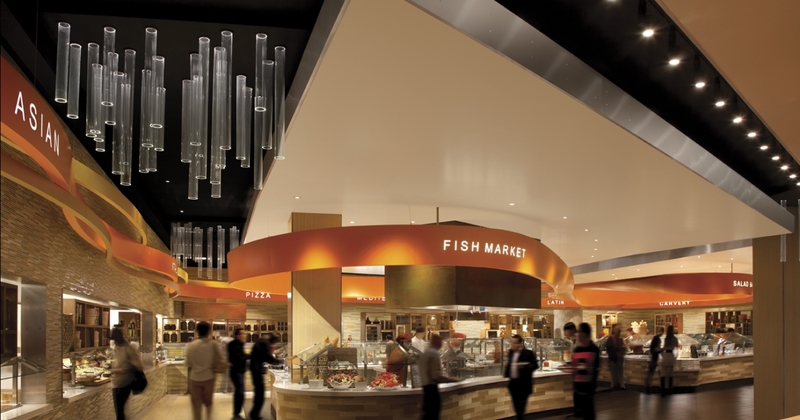 The Bacchanal Buffet serves 3,000 – 3,500 guests daily. 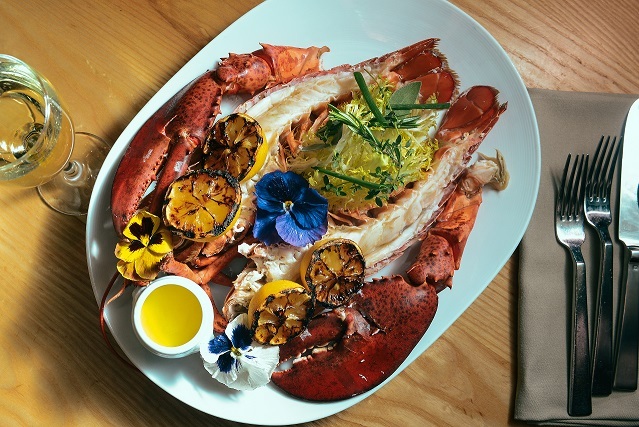 You can order a whole poached lobster at the Bacchanal Buffet for an additional $150. The meal includes immediate seating and a glass of Veuve Clicquot Champagne. Thousands of pounds of leftover food scraps from several Vegas hotels get picked up and are used to feed pigs at RC Farms in Las Vegas. The most expensive dish purchased: 26 Fleur Burgers sold at Fleur by Hubert Keller in Mandalay Bay in 2014 ($5,000 each). The Golden Opulence Sundae from Serendipity 3 at Caesars Palace is listed by Guinness World Records as the most expensive sundae in the world for $1,000. The sundae is made using three scoops of Tahitian vanilla bean ice cream infused with Madagascar vanilla and covered in 23-carat edible gold leaf. The chocolate syrup is from melted Amedei Porcelana, one of the world’s most expensive chocolates. Added to the dessert is a tiny glass bowl of Grand Passion Caviar, an exclusive dessert caviar, made of salt-free American Golden caviar, known for its sparkling golden color. The Ono cocktail at XS nightclub at Encore is undoubtedly Vegas’ most expensive at $10,000. Charles Heidsieck Champagne Charlie 1981 and Louis XIII de Rémy Martin Black Pearl Cognac are merged in a beautiful Champagne glass. Ideal for couples, this luxury cocktail comes with some additional bling –an 18-karat white gold necklace with a Tahitian black pearl pendant and XS logo for the lady, and a pair of 18-karat gold Mont Blanc cuff links featuring the solid gold XS logos. 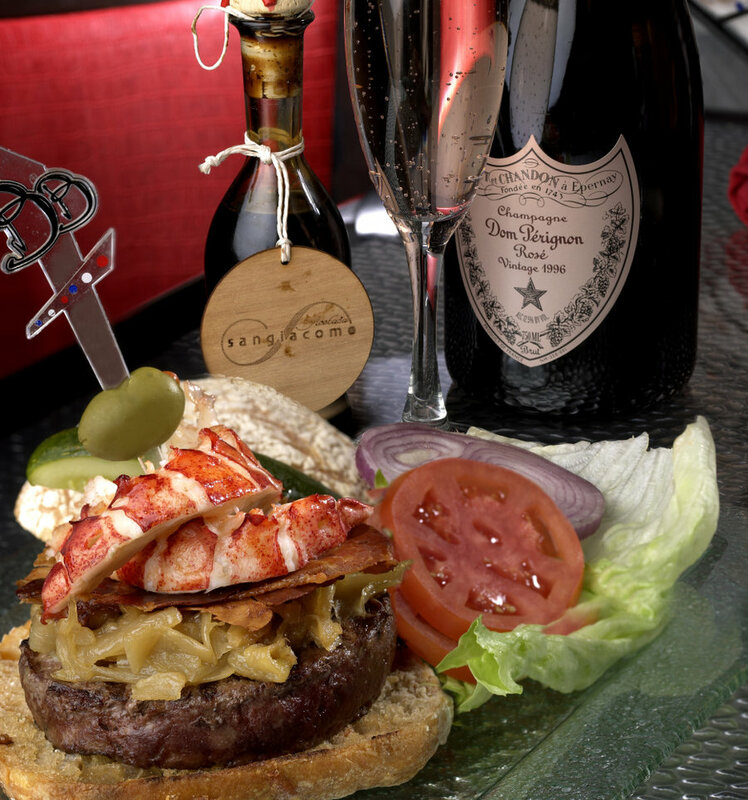 You can order a $777 Burger at Burger Brasserie at Paris Las Vegas. It’s a Kobe beef and Maine lobster burger. This rich combination is highlighted by caramelized onions, imported Brie, prosciutto and 100-year aged balsamic vinegar. The meal is served with a bottle of Rosé Dom Perignon Champagne.